For a guy who really doesn’t eat meat, let alone mysterious hot dog “meat,” I sure do love hot dogs. I’ve become sort of grateful that the Stern’s felt the need to include so many hot dogs on their “Eat Before You Die” list. 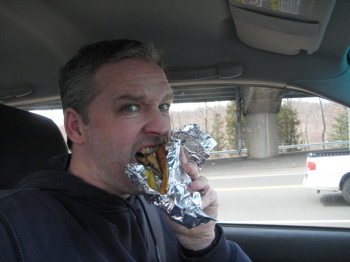 With each dog eaten for this blog, I’m that much closer to not eating hot dogs ever again. This sort of makes me feel kind of sad, but I’ll survive. And props to the Stern’s for seeking out some of the most interesting and teensy joints too, like Carolyn’s. 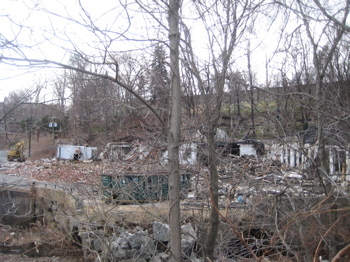 Seymour is one of those forgotten towns along route 8 and Naugatuck River known mostly for high school football and industries that used to dominate the town. Carolyn’s location shines a bright, somewhat damning light on that situation. Plunked in a parking lot just off of route 67 in front of an abandoned lumber yard and next to a demolished factory of some sort (at the time of my visit in early 2011 anyway), it’s not pretty. 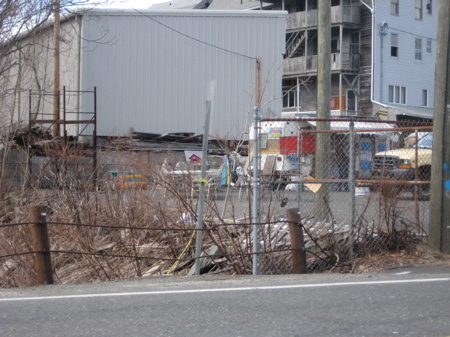 But now Carolyn Schumacher finds herself closer to home — parked just outside the vacant Seymour Lumber and Supply Co., which is about 400 feet from her old site in front of the former Housatonic Wire Co., which was ravaged by fire Sept. 11. 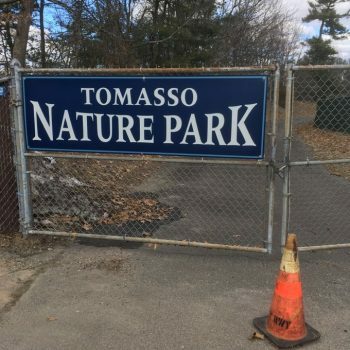 Both the Housatonic Wire and Seymour Lumber sites are part of a planned $20 million development which would bring a hotel, retail and residential space to the downtown area. Turns out, the firemen protected the little lunchmobile from the fire and now get to eat for free! Of course, firemen being firemen, they choose to pay anyway. The setting is downright ugly (for now). But Carolyn offers a happy oasis amidst the rubble. Her sunny disposition greeted a very hungry me (and a very asleep Damian – tired after his hike at Southford Falls over in Oxford, here) and her prices made me smile even more. They are downright ridiculous – Ridiculously cheap. With only five bucks in my pocket, I had stopped at an ATM on my way but there was no need to do so. That five bucks scored me two long dogs; one with chili and orange cheese! While not exactly healthy or nourishing, it’s nice to know I can still fill my belly for so little. A small cookwagon parked a few miles east of Seymour on Route 67, in a vacant lot at the former site of the Seymour Lumber Co., Carolyn’s is a hoot. It is open year round Monday through Saturday from 9am to 4pm, and as you might guess from the name, tube steaks are its specialty. They are tender-cooked Hummel-brand franks nestled in fresh soft buns and available in all sorts of ways, from plain (with condiments of choice) for $1.25 to cheese and bacon dogs for $1.75 and kielbasa and kraut for a whopping $3. They’re tasty little wieners; I am especially fond of the chili cheese dog, topped with moderately hot chili and bright orange molten cheese. An interesting variation is Carolyn’s “sweet and spicy” chili dog, blanketed with meat sauce that is mostly sweet with a peppery undercurrent. 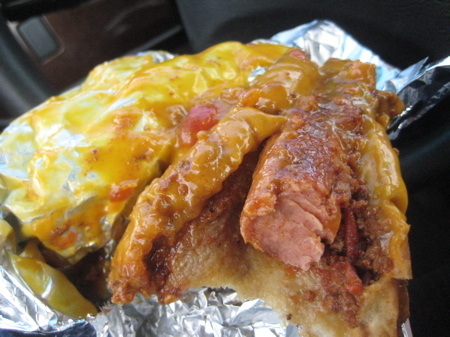 And the onion-sauced dog is a classic. 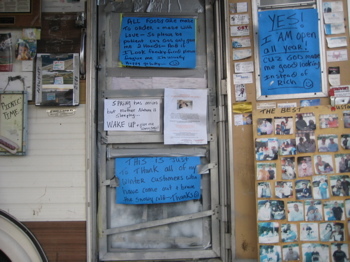 This place is especially fun to visit because of the joie de vivre of Carolyn her comrade Mary, who transform their little patch of real estate into a literal welcome wagon for passers-by, as well as for the regular customers who come from businesses all up and down Route 67. On a pleasant day, it’s great to sit at the picnic table and ingest two or three dogs in the sun. 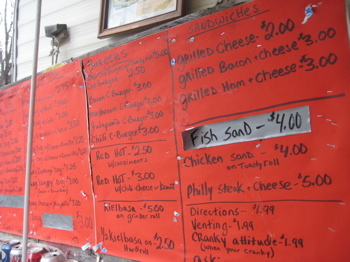 Carolyn told us that she’s been in the weenie business for eleven years now, but moved to Seymour from West Haven Beach because the year-around traffic here is steadier. I know I look forward to stopping by again whenever I’m in the neighborhood. I could never write “tasty little wieners,” but that’s just a failing on my part. I parked and found the menu much more comprehensive than I’d thought it would be. Fried fish sandwiches anyone? Not me, not today. 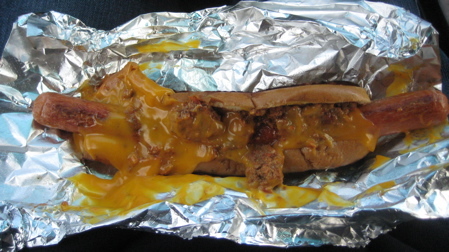 Today it was two long dogs, please – one with spicy brown mustard and one with the chili and cheese mentioned by Stern. Other patrons sat at the picnic table overlooking the fire-ravaged lot next door; lost in their lunches and seemingly oblivious to the busy intersection 20 feet away. Carolyn was as fun as her signs that cover the wagon. Sensing I wasn’t a local (like the gruff guy who parked right in front and allowed his large dogs to scamper about), she treated me warmly and made me feel as welcome as one could feel on a brisk and gray day in a crumbling lot. 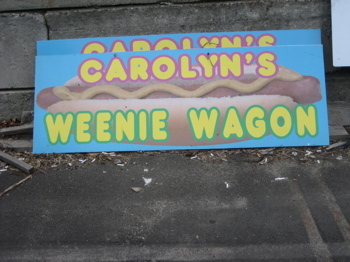 It’s easy to see why Carolyn and her wienie wagon are so beloved in these parts. She loves her job, loves the people she feeds and it comes through even in something as simple as a hot dog. She may be moved again if that whole development thing happens, but wherever she pops up, she’s worth the effort to find her.